This morning when I woke up, in those few fleeting moments betwixt dreamlike forgetfulness and full wakefulness, I realized with a jolt, that it was Sunday and yet another week had galloped by. This was the week that I purchased for the first time some liquid eyeliner. I am beyond minimalist when it comes to make-up but I do occasionally apply some foundation, eye shadow and mascara. However I have now set myself, heaven knows why, the task of trying to master the art of applying the liner. My first attempt didn’t look too good, but I will persevere. If anyone has any tips please let me know. On Friday evening, I went to a talk, given by Irish designer Peter O’Brien, called From Drawing to Dress. 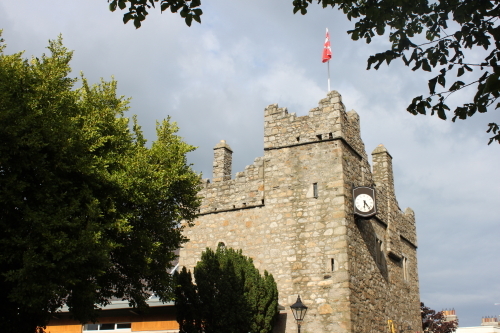 The talk was part of the Dalkey Book Festival (that’s Dalkey Castle in the top picture). Peter was very easy to listen to and had lots of interesting things to say. It sounds like his career was mapped out for him from an early age, as a boy he liked to draw, particularly pictures of ladies in ball gown. Obsessed with black and white movies in childhood, he remembers being upset when Joan Crawford walked into the sea in Humoresque, he wasn’t worried about her dying but was grieved that she would ruin her beautiful dress. His first job was as a window dresser in Dublin, he had a similar job in London, before doing a degree in fashion at St Martin’s School of Art, as a mature student,. He spoke about his working life in Paris with Dior, Givency, Chloë and Rochas. He is now a freelance designer and he chatted about the costumes he designed for the recent Abbey production of Pygmalion (they were glorious). There were loads of fabulous slides to illustrate the talk, some done with magic makers, which he has a special technique for using. Some of the things he likes that inform his design aesthetic are pleats, aprons, flat shoes, dancers and the juxtaposition of the masculine with the feminine. One of the things he said, that I latched onto, is that the plainest dress or outfit, is often the one that stands out most. He wasn’t proffering style advice, as he was taking in the context of costume design for the stage but I think I’ll bear it in mind when I am getting dressed in future. The sales started this week. I had actually planned to stay away but found that the giant red banners proclaiming large reduction acted as magnets and drew me shop ward, where inevitably I bought some things. One of my purchases is a sleeveless dress. Now Irish weather please, please could the sun shine for a few weeks so I get to wear my new dress. Note: Peter O’Brien’s talk was held in The Tramyard Gallery (www.tramyard.ie), he is one of their artists and they sell illustrations, cards and a limited edition sketchbook by him. 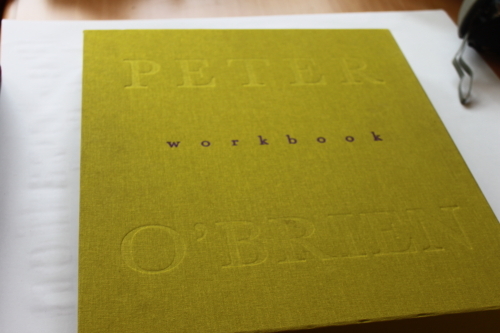 I just love Peter O’Brien’s work. I never had the nerve (or let’s face it, the money) to contact him for an haute couture piece but I used to be first in the queue when he was doing his diffusion range for Awear. One of my favorite dresses is a chiffon black dress I bought a couple of years back – an absolute classic that I know I will go on and on wearing. who looks absolutely beautiful without makeup. there is no hope of it improving any time soon. Ciao C.
Hi C and thanks for the double C – comment and compliment. 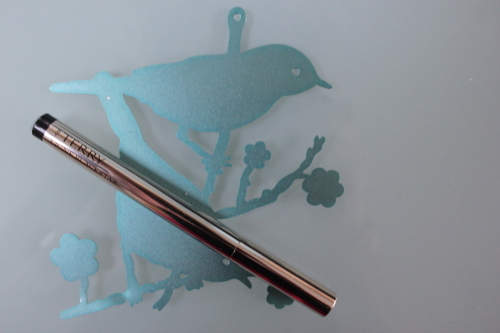 Mastering the eyeliner is proving difficult – I am hoping it doesn’t end up in the great make-up bag in the sky. The dress is still in the bag I brought it home from the shop in, pending a change in the weather (for the better) conditions. First time hearing your comments & thank you – All positive feedback very welcome. I have passed on the details to Peter to see your lovely report. X Clodagh, owner, The Tramyard Gallery.